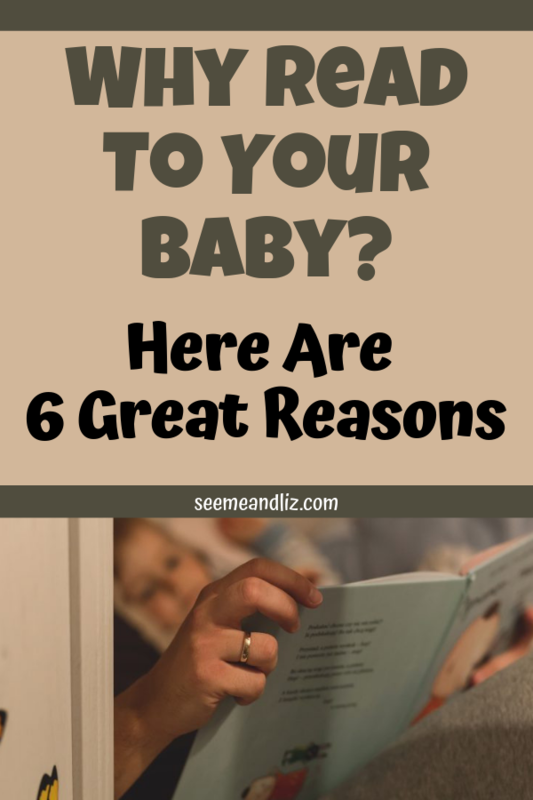 Seeme & Liz > Parenting Tips (0-2 year olds) > Why Read To A Baby – Here Are 6 Compelling Reasons! You’re probably thinking they understand the book and maybe it even bores them. But this can’t be further from the truth. While it is true that a young baby doesn’t understand all of the words you are reading, with continued exposure to these words in a variety of environments, they will soon grasp their meaning. Most parents instinctively read to their babies without really thinking of how it may help with their child’s language development later on. While this is wonderful (instinctively reading to a baby), it is also good to know exactly why reading to a baby is such an important early learning activity. One thing to note is that when you are reading to your baby (or toddler) the goal should never be to teach them how to read! Many studies are now showing that most children are not developmentally ready to learn to read until they are closer to the age of 6. Despite this, most schools are still expecting children to learn to read between the ages of 4 and 5. The answer to that is as soon as he arrives! You can even start reading to your little one in the womb, however, don’t feel like this is crucial to your baby’s development. Do it if you want, but don’t feel bad for choosing not to. 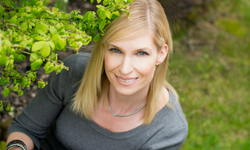 Even though I had many years of experience working with babies and young children before having my own, I still found the first 6 months of my children’s lives tough. Babies typically aren’t interacting with their parents until they are over 6 months old (you might get a few smiles before then, but that’s about it) and many parents (including myself) find it almost unnatural to talk to someone who isn’t able to respond, or even understand what you are saying. However, because of my background in child development specifically speech and language development, I knew the importance of interacting with my baby from day 1, despite how unnatural it sometimes felt. Reading is a great way to cuddle up and bond with your baby. When your baby is not mobile you don’t have to worry about her running away a page into the book. They will listen to you intently. Reading to your baby also helps them get used to the sound of your voice. Make sure you use inflections and intonation while reading to keep them engaged. 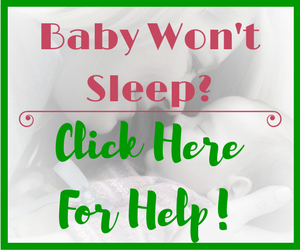 If you read in a monotone voice, you may end up putting your little one to sleep! In the section above I mentioned using intonation and inflection during book reading with your baby. This isn’t simply to make sure your baby stays interested, it is also teaching them about language and how sentences and questions are formed. If your pitch raises at the end of a sentence, your baby will start figuring out that this type of sentence is a question. So make sure you pause after asking questions. Use expression in your voice when reading! 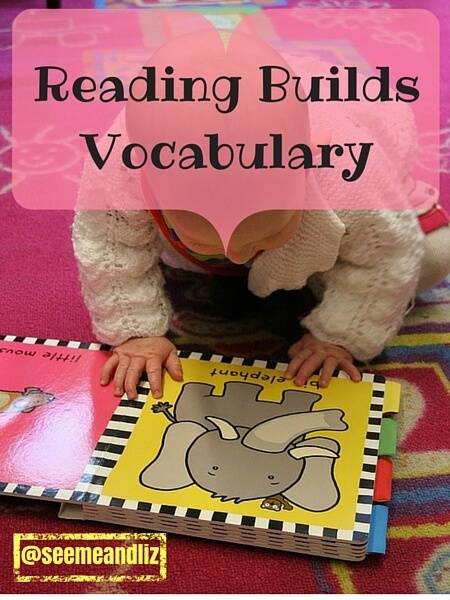 By reading to a baby, you are exposing them to many new vocabulary words. A great thing about babies is that you can actually make up your own stories when looking at picture books, since they can’t read the words. In fact, you don’t have to read the text at all! Talk about what you see in the pictures. Point to and label simple words that can be found in the pictures. Did you know that a preschooler’s vocabulary size is one of the best indicators of success later on? 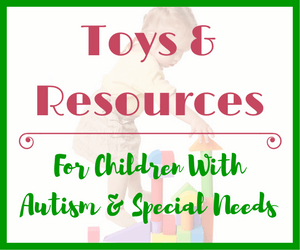 This is more important than your toddler being able to count or “read”. 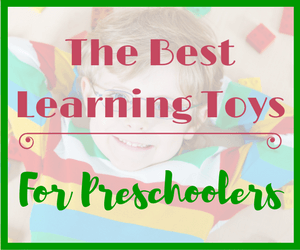 In order for your preschooler to have a large and varied vocabulary, consisting of nouns, verbs, adjectives, etc. they must be exposed to new words daily, starting from birth. And book reading is a great way to do this. Babies who are read to regularly tend to be more interested in books as preschoolers and school aged children. But remember, keep reading fun! You, the parent is doing the reading. Your baby is simply listening and taking it all in. They love hearing the sound of your voice and you will probably see some smiles when you pick up your child’s favorite book! As your baby gets older, let them choose a book. Place 2-3 books in front of them and ask “which book should we read, you pick”. If your baby isn’t pointing or grasping yet, look for eye gaze. If they look at one book more than the others, read that one! As you can see, some guesswork on your part will be required. But the more you involve your baby, the more fun reading will be! This is true for older children and adults too! Reading is a great way to build memory skills. And when someone is reading aloud to you, you need to listen in order to retain any of the information. The earlier these skills start developing the better. By reading to your baby and interacting with them at the same time, they are also learning valuable social skills. In the “expand vocabulary” section I mentioned pointing to pictures of what you are “reading” or talking about. Your baby will start looking from you to the picture and back to you again. This also goes for pointing and vocalizing. These are all early forms of social skills (turn taking, eye contact, etc). The Benefits Of Reading To Your Baby Are Endless! As you can see the answer to the question “why read to a baby?” is simple. Reading to your baby will give their language development a boost. So don’t wait, start reading with your baby as early as possible. But with so many books to choose from, it can get overwhelming. So be sure to read this article about how to choose the best books for your baby’s language development. It’s so interesting to think about how a child develops language from knowing absolutely nothing, and when you think about it hard, it has to be from hearing you use those words! My little boy is almost 2 years and I’ve been reading to him on a regular basis since he was around 10 months old. He used to love lift the flap types of books and now that he is a little older he is starting to say the words back to me, it’s really encouraging! I have baby number 2 on the way and I will definitely try and read to him at an even earlier age. What kind of books do you recommend for young babies? Or could it even be that you read your own magazine aloud? Would that benefit a young baby too since they don’t understand the words anyway? 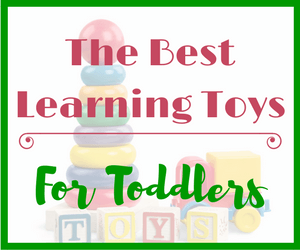 Yes, language development really is amazing! 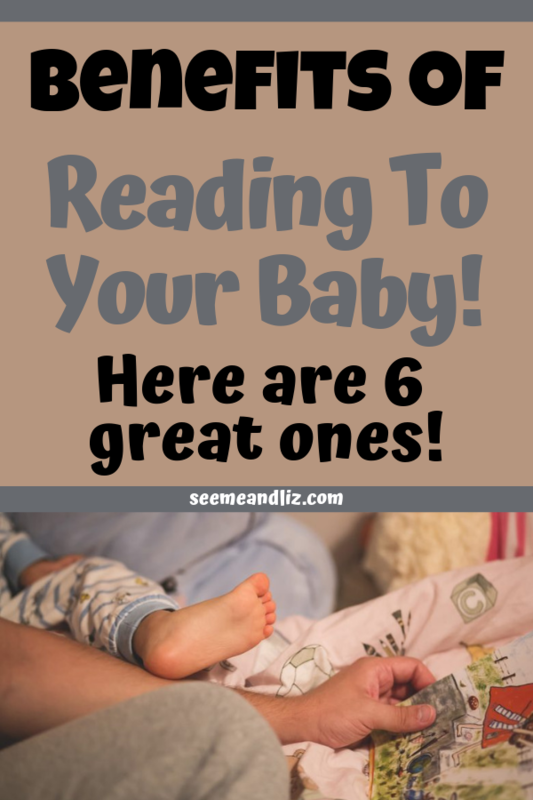 Here is a post that should give you some great suggestions for books to read to babies and toddlers The Best Books To Read To Babies To Enhance Language Development! You could read a magazine out loud as well. When babies are really young they appreciate just hearing their parent’s/caregivers voice. You could also look at some pictures in the magazine and talk about what you see. Your baby/toddler won’t care that you aren’t reading any words! Wow, that was an amazing read, I have actually bookmarked the site, to go through it again. Currently studying Early Childhood ed. it’s very informative, especially about late talkers ( my nephew was a late talker) and he does not have learning difficulties. 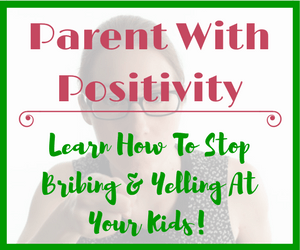 But was wondering what will be the best way to support a child with stuttering problem?- ( he has serious stuttering problem. Thanks for reading the article and taking the time to leave a comment. As for your question, stuttering can be normal depending on the age of the child and the frequency with which the stuttering occurs. If the child is 4 years old or older and is stuttering, I would suggest having him seen by a speech language pathologist to determine if it is still considered normal or not. My brother just became a father a few months ago and we’re starting to read the stories to the little girl. I mean it’s just how it was always done right ? My parents read them to me and now we’re going to read it to our own children, but we never really doubted or asked ourselves why are we doing it ? You pretty much explained it why and my curiosity has been satisfied. Thanks! Thanks for your comment! 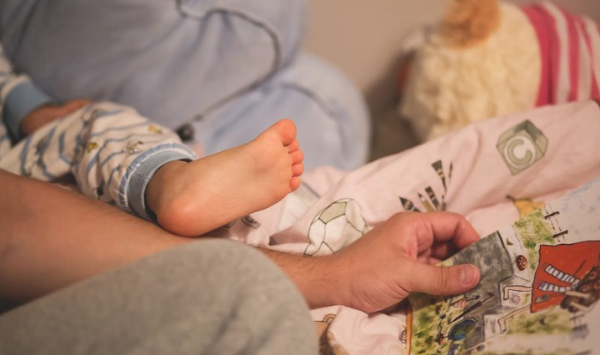 Reading to a baby is instinctual for most parents, but it really helps to know how such a simple activity can provide some great foundations for future learning.